CUSTOMIZABLE version of our favorite beer dispenser! Search B01N0KIEOS to see reviews for our non-customizable version. IMPRESS YOUR FRIENDS AT HOUSE PARTIES: Treat the crew to draft beer without the expense and hassle of a keg. Fill it at a brewery or with your homebrew and enjoy perfectly carbonated beer. PERFECT GIFT for any craft beer lover! 5 Liter capacity can handle any size occasion! GREAT FOR HOMEBREWERS TOO: Rack your homebrew directly into the craft tower, carbonate, chill and serve. Use the closed cap for natural carbonation or force carbonate with the included 0-25psi regulator. Click “Customize Now” to choose your design and enter your personalization information. The Spotted Dog Craft Tower is the perfect beer dispensing system for your bar or home! The Craft Tower serves as a table-top beer dispenser at breweries, bars, or at a house party or event. Your typical plastic beer towers are unattractive, unpressurized, and downright fragile. The home user will find that the Craft Tower allows them to have a local/seasonal beer they love at home without the hassle of purchasing an entire keg or hunting down rarely-bottled brews. The easy-to-use system comes with two feet of tubing connecting the mini-keg to the faucet. The heavy-duty regulator can accept both 3/8″ THREADED or 5/8″ THREADED disposable CO2 cartridges. 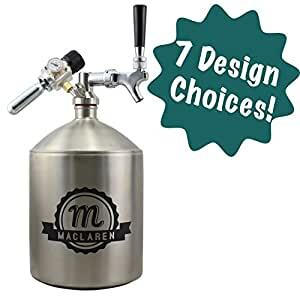 Includes: Personalized stainless-steel mini-keg with air-tight cap, adjustable psi regulator, stainless steel dispense cap with a vinyl dip tube, and a chrome beer faucet. Does not include: Carbon dioxide cartridges, fresh, tasty beer, a designated driver.